In 1991, an elaborate rumor circled the African American community. The rumor was that a brand of soda, Tropical Fantasy Soda Pop, was made by the Ku-Klux-Klan. Not only that, but the soda was made with a special formula that made black men sterile. Of course, it was just a rumor—and one that turned out to be false. Nevertheless, sales of the soda dropped by 70% following the rumor, and people even began attacking the company’s delivery trucks. How do rumors like this spread, and how can they become so powerful that they prompt action even when there’s no merit to the claim? What Counts as a “Rumor”? They are unverified. This is key. If I’m at a high school reunion, and I try to spread the news that Jeff and Tina just had a babyOf course they did., that’s not a rumor if Jeff and Tina posted the baby’s picture to Facebook. Yes, it’s informative and in circulation, but since it’s been definitively verified as true, it’s not technically a rumor. *If you’re interested in how rumors are different from “gossip” Oh, hi. You’re interested enough to check out this particular footnote. Okay, when it comes to gossip, psychologists have noted that gossip is more like casual conversation about individual people. It’s mostly for amusement, reinforcing standards for “appropriate” behavior, or to exclude certain people from a group. Again, rumors by definition are unverified. Gossip could be totally verified, but it’s being spread for more social reasons—not in order to understand an important and confusing situation. and “urban legends,”Whereas rumors are little isolated information statements, urban legends are more specifically stories, complete with settings and characters and plots. The end goal of an urban legend is to be a good story. A rumor is meant to lend understanding to an ambiguous situation. see the previous two footnotes! This confusion opens the door to rumors, which people can hold onto in order to give them at least some idea about why the world is working in the way that it is. In 1947, Gordon Allport and Leo Postman published the book, The Psychology of Rumor. Although rumors were a pretty hot topic in social psychology around that time, it got more and more difficult to study rumors well. In the last several years, however, there’s been a renewed interest in the psychology of rumor. Here’s a quick review of what that research has found. It’s when we don’t already have a firm grasp on how or why things are happening in the world that rumors start to spread. If you can imagine being in middle school again, imagine what would happen if one day, out of the blue, one of your classmates stopped coming to school. There’s a ton of uncertainty there, so people would probably develop and spread rumors as a way to get a handle on what happened. In fact, a field experiment in 1955 did just that: the researchers strategically withdrew a student from a grade school class without explanation. Not surprisingly, rumors started to fly as students tried to make sense of the situation. Oftentimes uncertainty breeds anxiety—we like to have a clear sense of the world, and we get anxious when we feel uncertainty—and anxiety on its own has been linked to rumor spreading. Some research has shown that more anxious people tend to be the ones who are more likely to spread rumors. Another fascinating experiment made some students feel especially anxious about an upcoming interview. The students who were made to feel more anxious spread rumors more quickly than the less anxious students in the control group. Research has also shown that “dread” rumors (i.e., rumors that something bad is going to happen) spread more than “wish” rumors (i.e., rumors that something good is going to happen). This is the case both for rumors spread online and for rumors spread in person. As much as you might be dying to talk about the rumor you heard about the company you work for, I probably don’t care a ton. The reason is that it’s just not that relevant to me. I, on the other hand, would be itching to talk about some other rumor that’s more important to me. 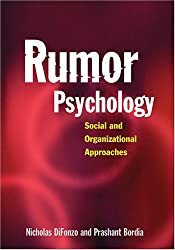 In fact, Allport and Postman’s “basic law of rumor” that they developed in 1947 was that spreading rumors depends on both the ambiguity of the situation and the importance of the rumor. Across a whole bunch of studies, people are more likely to spread rumors when the information is more important to them. Let’s face it—if you hear a rumor that you think is completely ridiculous, you probably won’t find yourself on a mission to spread that information far and wide. For example, one study looked at the spread of rumors during a university strike. It was the rumors that were more believable that ended up spreading the most. Plenty of research has shown that people often want to feel good about themselves, but one way people can do that is through rumor spreading. There are a couple reasons this can happen. One is that spreading a rumor positions you as someone who is clued into what’s going on in the world. People might then come to you as the one who’s especially informed. Another way rumor spreading can boost self-esteem is when the rumor is about another group. Other research has shown that putting down other groups can boost people’s self-esteem. Lots of rumors, it turns out, are about a group’s “opposing” group. These have been called “wedge rumors” and serve to reinforce intergroup differences. Clearly, these can boost self-regard by elevating one’s own group about a rival other group. This might sound like reason #5, but there’s a subtle difference. Reason #5 was that people feel better about themselves when they help spread rumors. There’s a little more to it, though, which is that people can use rumors to strengthen their social ties. Want to be accepted by a group? Pass along some rumors about their rival group. The evidence for this can be seen in studies where people tell different rumors depending on the person they’re telling them to. Specifically, the question was whether people would pass along a rumor that one school group’s ranking had decreased or whether they’d pass along a rumor that the group’s ranking increased. The results showed that it depended on who would be receiving the rumor. If it was someone who was part of that group, people were more likely to spread a positive rumor about them. If it was someone who was part of a rival group, then people were more likely to spread the negative rumor. The point is that people spread rumors strategically, to gain the respect of others. Have you seen rumors spread? How well do these psychological findings help explain why? Let us know in the comments! 1. ↑ Of course they did. 2. ↑ Oh, hi. You’re interested enough to check out this particular footnote. Okay, when it comes to gossip, psychologists have noted that gossip is more like casual conversation about individual people. It’s mostly for amusement, reinforcing standards for “appropriate” behavior, or to exclude certain people from a group. Again, rumors by definition are unverified. Gossip could be totally verified, but it’s being spread for more social reasons—not in order to understand an important and confusing situation. 3. ↑ Whereas rumors are little isolated information statements, urban legends are more specifically stories, complete with settings and characters and plots. The end goal of an urban legend is to be a good story. A rumor is meant to lend understanding to an ambiguous situation. Super interesting post. I was not familiar with any of this research! Really accessible write up, too. Great reminder for the female high schooler. Thank you! was amazing thanks but a little qes. it is all from the book? By “the book”, do you mean the book in the picture? If so, then I would guess that much of this is covered in that book. But if you follow the links throughout the article, you’ll see that the research I’m reviewing is published in academic journals. It had been found which anxiety may motivate individuals to spread gossips and i discover that this makes lots of sense. After just about all when individuals get nervous and concerned about something these people tend to consider that thing more regularly. Now when that occurs people become prone to spread rumors because they talk concerning the things these people fear. Spreading individuals rumors can, in fact, make those individuals feel better because they turn the actual uncertainty into facts. Humans generally possess a strong convenience of self-deceptiveness. I stated earlier that lots of people prefer to accept stuff that doesn’t seem sensible just to create themselves really feel good. Underneath the effect from the powerful pressure of anxiety lots of people try to create sense associated with certain events simply to ease their own worries.